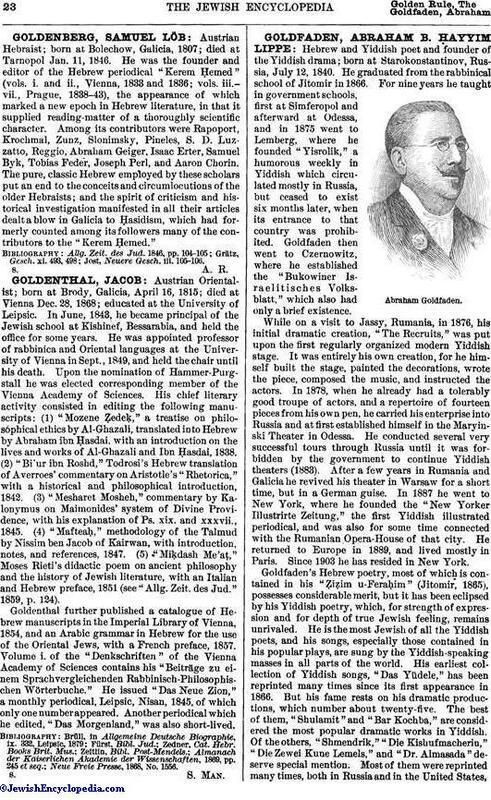 Hebrew and Yiddish poet and founder of the Yiddish drama; born at Starokonstantinov, Russia, July 12, 1840. He graduated from the rabbinical school of Jitomir in 1866. For nine years he taught in government schools, first at Simferopol and afterward at Odessa, and in 1875 went to Lemberg, where he founded "Yisrolik," a humorous weekly in Yiddish which circulated mostly in Russia, but ceased to exist six months later, when its entrance to that country was prohibited. Goldfaden then went to Czernowitz, where he established the "Bukowiner Israelitisches Volksblatt," which also had only a brief existence. While on a visit to Jassy, Rumania, in 1876, his initial dramatic creation, "The Recruits," was put upon the first regularly organized modern Yiddish stage. It was entirely his own creation, for he himself built the stage, painted, the decorations, wrote the piece, composed the music, and instructed the actors. In 1878, when he already had a tolerably good troupe of actors, and a repertoire of fourteen pieces from his own pen, he carried his enterprise into Russia and at first established himself in the Maryinski Theater in Odessa. He conducted several very successful tours through Russia until it was forbidden by the government to continue Yiddish theaters (1883). After a few years in Rumania and Galicia he revived his theater in Warsaw for a short time, but in a German guise. 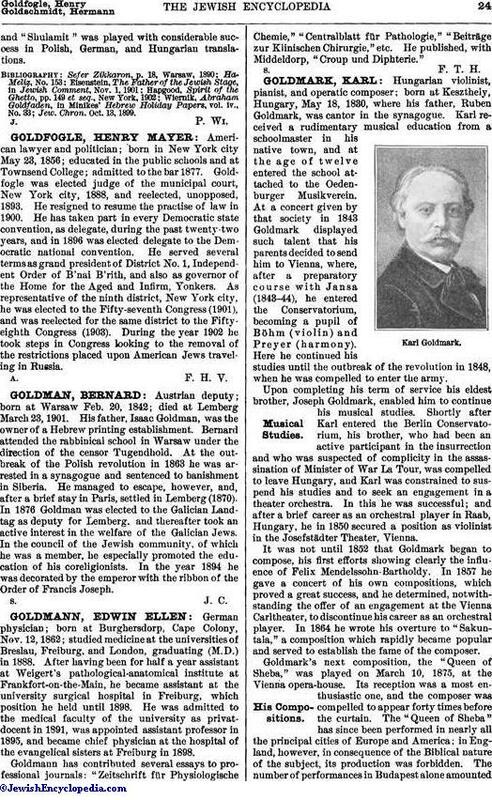 In 1887 he went to New York, where he founded the "New Yorker Illustrirte Zeitung," the first Yiddish illustrated periodical, and was also for some time connected with the Rumanian Opera-House of that city. He returned to Europe in 1889, and lived mostly in Paris. Since 1903 he has resided in New York. Goldfaden's Hebrew poetry, most of which is contained in his "Ẓiẓim u-Feraḥim" (Jitomir, 1865), possesses considerable merit, but it has been eclipsed by his Yiddish poetry, which, for strength of expression and for depth of true Jewish feeling, remains unrivaled. He is the most Jewish of all the Yiddish poets, and his songs, especially those contained in his popular plays, are sung by the Yiddish-speaking masses in all parts of the world. His earliest collection of Yiddish songs, "Das Yüdele," has been reprinted many times since its first appearance in 1866. But his fame rests on his dramatic productions, which number about twenty-five. The best of them, "Shulamit" and "Bar Kochba," are considered the most popular dramatic works in Yiddish. Of the others, "Shmendrik," "Die Kishufmacherin," "Die Zewei Kune Lemels," and "Dr. Almasada" deserve special mention. Most of them were reprinted many times, both in Russia and in the United States,and "Shulamit" was played with considerable success in Polish, German, and Hungarian translations. Jew. Chron. Oct. 13, 1899.